[Contains mature themes] Free for a limited time to Audible members. After ten years, a husband tells his wife he no longer wishes to be married. A month later, stuck in limbo, they come to Esther. She helps them have an honest conversation about their expectations, desires, and the ways in which their role as parents has left little room for intimacy. [Contains mature themes] Free for a limited time to Audible members. An on-again, off-again couple in their fifties, dating in a post-divorce landscape, are struggling with different world views, priorities and sexual interests. Recognizing that their polarized dynamic takes the fun out of spending time together, Esther guides both towards less rigid perspectives. [Contains mature themes] Free for a limited time to Audible members. A young couple has endured a series of crises early in their marriage, from a benign brain tumor to a serious car crash to the husband’s near-fatal heart attack. Following his recovery, he’s adapting to new physical limitations, while she says the children bear the brunt of his frustrations. 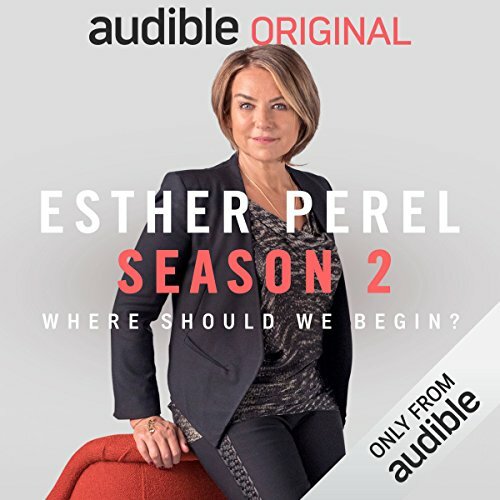 Esther coaches them through an honest conversation on anger, parenthood and the power of apology. [Contains mature themes] Free for a limited time to Audible members. What began as an eight-year affair between two women has stretched into a 19-year partnership. But despite their private commitment to one another, they’ve never quite managed to move beyond the shame of their origin story. Esther takes a novel approach to revealing a long-held secret. [Contains Mature Themes] Free for a limited time to Audible members. They’ve been together for more than a decade, but this isn’t the first time they’ve separated. Stuck in a cycle of explosive escalations, a husband and wife want to make it work but can’t break their habit of going for the emotional jugular. Esther encourages them to start their conversations differently. [Contains Mature Themes] Free for a limited time to Audible members. After a discovery in her doctor's office, a woman realizes her husband has been unfaithful. While betrayed and angry, she still feels a desire to stick it out for the sake of the kids. He, meanwhile, is desperate to find a way back to her. Esther takes them back to their upbringing's and the years before the infidelities to find a place of mutual compassion. [Contains Mature Themes] Free for a limited time to Audible members. Almost two years ago her husband was diagnosed with early onset Parkinson's Disease. They have three kids, a mortgage to pay, and he has developed some compulsive behaviors he isn't proud of. Esther helps them learn how to turn off the 'caregiver,' and remember they are much more than that to each other.